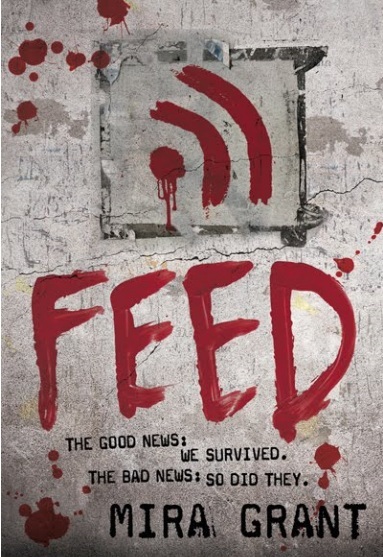 Feed. (Newsflesh Trilogy Book #1) – Mira Grant. I’m sorry, I can’t actually read this last page BECAUSE OF THE TEARS. Or at least the metaphorical ones… because I don’t cry at books… but you get what I mean. This book is horrifically sad. TENSION. Man, this book was tense I practically have no nails left. Red light green light red light green light red… ARGH. Subtle but effective writing that feeds (sorry… couldn’t think of a better word) little clue snippets into the dialogue so you’re left guessing write up until the end. And speaking of the end…in the great words of Bony M…. oh ma looooord. This book was totally not what I was expecting and it always left me guessing. I don’t mean to sound big headed, but I quite often predict what is going to happen in things…not because they are necessarily flimsy plots, but because I’ve watched a lot of television and read a lot of books. So even though I had some pretty major quibbles with this book, I loved this book so much, not only for having an interesting story, exploring fascinating concepts and ideas but for proving that actually, Jo… you’re not as smart as you think. Because damn, I did NOT expect this book to go the way it did. Flabbergasted. This book really started off sooooo slow and it took quite a while for things to happen. There was also a lot of politics and even though it was interesting to get the back story and why what was happening was happening, I found it to be unnecessarily in depth and it became quite repetitive. I understand that it was important for the reader to get understand the big ideas (especially when you read Deadline, the second book of the trilogy)… but it did become a bit tedious. The blogging/technical side of things. Gosh there was a lot of technical jargon in this book (which is probably a high point for a lot of people, but I am a geek but not a computer geek) and a lot of it went over my head. This is probably my fault for my eyes glazing over whenever big bro tried to explain computer things to me… but about 60% of this was lost on my poor English Literature/Film Studying brain. I loved Georgia as a character- she is intelligent, resourceful, dedicated to her profession and the search for truth and she’s caring but she’s not a simpering girly girl, which was great because I don’t think I could have handled romangst in this book. BUT… I really didn’t like her as a narrator. I like to connect with my narrators and I’m not saying George was heartless or anything, but… I think the only thing I had in common with her is how I take my caffeine: Cold. I briefly mentioned George in the low points section… so I won’t go on too much about her. I’ll focus on my positive feelings towards her. I thought she was such an original character… a girl who runs a blog documenting the world post- zombie rising, who surpasses all the boys with her mad computer skills and can kill zombies? YES PLEASE. And also, she’s a writer looking for the truth. Aren’t we all, George? Aren’t we all? What I loved about her was that even though George is a complete tom boy and perhaps the furthest away from loving material things as you can get (except for the hair dye, of course! )… she wasn’t really aggressive with it. She is different than all the other girls but she accepts this and just gets on with it and gets on with her job. I’m so glad that Grant wasn’t like ‘LOOK HOW ORIGINAL THIS TOMBOY CHARACTER WHO DOESN’T LIKE FASHIONABLE CLOTHES AND DOESN’T UNDERSTAND BOYS IS’ all the time, because in a lot of dystopian novels (*cough* Mockingjay *cough*) this happens and it’s so off-putting and amazing characters (*cough* Mockingjay *cough*) are ruined by this. Even though I didn’t have much in common with George and didn’t relate to her as much as I have narrators in other books I’ve read… I appreciated that it was her telling the story because in hindsight (which, of course, is 20:20) I don’t think this book would have worked if it hadn’t been told from how she saw it from behind her aviators. Which leads me nicely to Shaun (and yes, I immediately thought of this and this) but no offense to Simon Pegg, who does have some kind of nerdy British charm and an understandable fondness for Cornettos… this Shaun was muuuuuuch cuter and yes, I have a crush on him. He is George’s brother, co-worker and best friend. But unlike George, he’s kinda glad there are zombies everywhere because his job is to go into the field and report on the zombies from up-close. And, of course, poke them with sticks. Shaun is such a great character: he’s hilarious, he’s stupid, he’s a typical boy, he’s dangerous, he walks around in his underwear (BOOM. ), he’s reckless but he has such a good heart and he’s so honorable and just a massive cutie in cargo pants. I also love the relationship between George and Shaun, it’s such an interesting dynamic because normally with sibling relationships in books it seems so forced and ‘Ohh my brother/sister is soo annoying’. But G & S really care for each other, they rib each other but they seem to slot perfectly together, their relationship was my favourite part of this book. Sigh. Ignoring the fact that the flesh-eating zombies are kinda baddies… I was a little disappointed with the main, main baddie. I like my evil characters with a bit of mystery and intrigue but this one seemed to just stroll up on the page and be like ‘HI JO, I’M EVIL AND I’M GOING TO CAUSE PROBLEMS. MUHAHAHA’ as he twiddled his moustache. BUT BUT… I’m writing this book after I read Deadline and like I said about hindsight being great, even though the baddie in Feed wasn’t the best…Grant did an amazing job at setting up the baddies for book numero deux. The bigger picture ‘n’ all. 10/10. GOD. This book. I finished this book a few days ago but I literally couldn’t bring myself to write about it because the ending shocked me and affected me so much. I keep thinking about it and nearly drown in the emotion that it brings. There are a lot of deaths in this book, some are pretty obvious and easily to predict, but they are dealt with such raw emotion that even though you may have guessed it was coming, you still feel your heart ripped out and mourn with the characters. People who think zombies are better than unicorns. People who like adventure books. People who like dystopian books that have a bit more ‘ooomph’ to them. People who don’t mind their stories lacking in romance. People who like strong, original and unflappable female narrators. People who are interested in journalism and the way news is presented. People who like conspiracies. People who are scientifically inclined. People who saw 28 Days Later and thought “I want to go to there”. People who believe in exposing the truth, no matter what. People who have a brother/sister. People who would quite happily tolerate their boyfriend poking rabid dead people with sticks because he’s super cute. People who have nerves of steel. People who have no tear ducts and/or emotions. « The Absolute True Diary of a Part -Time Indian – Sherman Alexie.